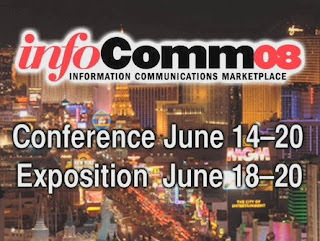 Barbizon Lighting Company Blog: Next Up: InfoComm in Vegas Baby! Next Up: InfoComm in Vegas Baby! "Your so money and you don't even know it!" - Vince Vaughn in "Swingers"
Our trek back and forth to Vegas continues the week of June 16th where AV and production people converge on the Las Vegas Convention Center for InfoComm. Lighting, Sound, Video.. it's going to be an audio visual nerd's dream. Barbizon Lighting is going to be there too.. right in the middle of it.. and we'll be posting updates of the neat things we see. We're going to be in booth # C4930 Map It. Stop by and say hello..
We're also going to have the Magink! demo there we had at AIA that was so popular so you can see it in action. If you still need a free VIP floor pass click on the image above and use the VIP code " VMAE1 "